which both supports Edit of Avisynth script (with keyword hi-lite) and Play of the script, really quite a lot more useful than NotePad standard. usable and what I use (together with MPC-HC in PsPad) to view/test scripts. Give'it a whirl, you might like it. You can actually set that inside both PsPad and NotePad+ settings. EDIT: In XP, some clips do not play in MPlayer2.exe, but for most, I much prefer over WMVxxx. In XP, MPlayer2, is located in same directory as WMVxx (C:\Program Files\Windows Media Player\). a DVD player included (REALLY basic) , just not an MPEG2 decoder, called DVDPlay.exe (I think, in system32), dont know if it is still there. Last edited by StainlessS; 20th December 2017 at 01:59. TinMan, the idea is that when opening a script open the notepad, as with the old avisynth, if not then I do not understand the idea of file associations, using FileTypesMan was not what I had in mind with AVS+. Last edited by GMJCZP; 20th December 2017 at 01:52. 'Open With', (and tick the 'Always' [or whatever its called] tick box). EDIT: You can still then use "Open With" on the odd occasion for VDub. Last edited by StainlessS; 20th December 2017 at 02:03. Thanks for the update pinterf. 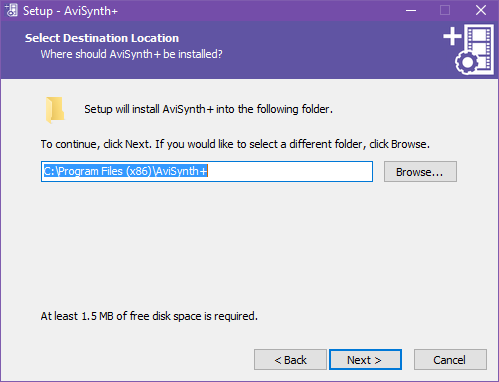 ...I got a little confused/concerned because I thought a) maybe it would now install the Avisynth.dll file itself in that folder, and b) I might be about to get only the x86 version. Of course, it did neither, but I think it would be useful to explicitly state at that stage of the installation that it will install both x86 AviSynth+ in C:\WINDOWS\System32 and x64 AviSynth+ in C:\WINDOWS\SysWOW64, and that the folder being chosen at this stage of the installation is just for the plugins for both versions, along with the license and uninstaller etc..
Actually I didn't. That was just a "dumb" folder, with no files in it being used in my existing AviSynth installation. When I renamed it and ran the installer again, it was ignored. It's the other way around (x86 to SysWoW64, x64 to System32). Yes you did. The detected directory is the "default" value in "HKEY_LOCAL_MACHINE\SOFTWARE\Avisynth". 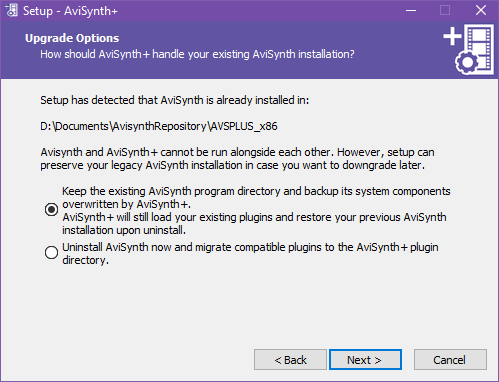 Although not strictly necessary, some programs use this registry value to determine if Avisynth is installed (that's why the Universal Installer writes it too). This entry is also written by the classic Avisynth installer. Last edited by Groucho2004; 21st December 2017 at 10:27. Thank you, pinterf. Sorry for disturbance. And wish you a happy Мerry Christmas. Last edited by mcjordan; 23rd December 2017 at 19:29. Excuse me pinterf, did you read by chance post # 3800? Thanks. Yes, but I placed the editor option into "Open With" intentionally in order not to overwrite notepad++ or other existing associations. I could still use rightclick on avs file and select notepad and tick "always use this program" (I'm on win10). I'm not near a computer but I think the reinstall will keep the setting of that checkbox. The problem is that if you use "always use this program" the script icon will be notepad and not AVS+, which does not happen with the old avisynth. Cant you just (on XP at least), select Windows Explorer, "Folder Options/File Types" and find "File Extension"
chosen icon, then "OK" and "Close". I guess if you change avs version a lot, & havta do it every time it could get a bit tedious. sometimes cleared, but I cant remember under what conditions. (not affected by "Do Not Cache Thumbnails"
or Administrators Tools [where all icons are different, no point at all in icons when a folder full of identical file types]. has died out. Seems you have to be an IT Pro to want to change file icons, here suggests using ShellExView utility. Last edited by StainlessS; 24th December 2017 at 18:36.
sometimes cleared, but I cant remember under what conditions. You can delete the cache manually by deleting "IconCache.db" in "%USERPROFILE%\Local Settings\Application Data". EDIT: Cant say that I've ever noticed what icon avs came up under. That's why I prefer the installer of the old avisynth, which already does everything automatic. I only ask that if it is possible to emulate this with the AVS+ installer and not have to resort to a program like FileTypesMan to do things manually. Thanx Grouchy, knew I'de seen it somewhere. [EDIT: also forgot about Thumbs.db, I always Do Not Cache Thumbnails]. Last edited by StainlessS; 24th December 2017 at 18:46. I decided to give Avisynth x64 a try after a very long time; however, I am not sure how I can use Avisynth x86 and x64 at the same time. I used the latest installer for AVisynth+ MT (r2574) which installs the 32-bit DLLs into SysWOW64, and the 64-bit DLLs to System32. With this configuration, MeGUI x64 can load my existing Avisynth scripts correctly; however, MeGUI x86 and VirtualDub x86 do not work (MeGUI crashes with C:\WINDOWS\SYSTEM32\avisynth.dll as faulting module path, and VDub generates an illegal instruction error). If I move the 32-bit DLLs to System32 and overwrite the 64-bit ones, then the x86 apps work correctly (but MeGUI x64 obviously does not). It seems all these apps default to System32 to find avisynth.dll. Am I missing something here? Is there any way I can use Avisynth x86 and x64 at the same time and choose which one to be loaded depending on the application?